I’m very thrilled to invite you to my exhibition tonight (6-9 pm) in downtown Raleigh. 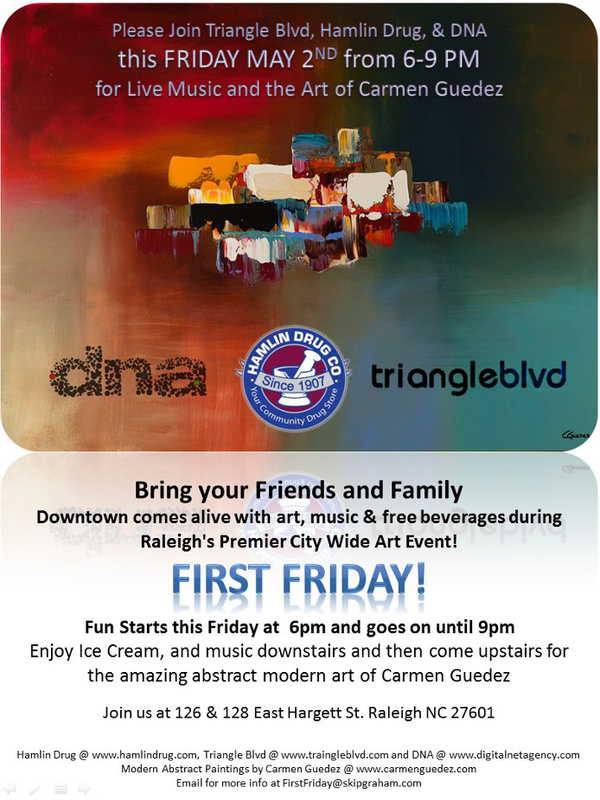 We’ll have ice cream, live music, wine and other beverages all for free. Everybody is welcome to join us! It will be so much fun!!! Address: 128 E. Hargett St., Raleigh, NC. Thanks to Triangle Blvd Tv, Hamlin Drug Co, and DNA for kindly sponsoring this event. This entry was posted in Abstract Art Site and tagged Art, Exhibition, original paintings on May 3, 2013 by Carmen Guedez.